Global adaptive optics (AO) market expected to reach USD 10,665.88 million globally by 2023, growing at a CAGR of around 61.49% between 2018 and 2023. AO corrects a wavefront by an optical element which changes form when an outside control signal applied. A deformable mirror is an adaptive element with the controllable reflective surface shape. The report analyzes and forecasts adaptive optics market on a global and regional level. The study offers past data from 2015 to 2017 along with forecast from 2018 to 2023 based on revenue (USD Million). Assessment of adaptive optics market dynamics gives a brief thought about the drivers and restraints for the Adaptive Optics market along with the impact they have on the demand over the years to come. Additionally, the report also includes the study of opportunities available in the adaptive optics market on a global level. The report gives a transparent view on the adaptive optics market. We have included a detailed competitive scenario and portfolio of leading vendors operative in adaptive optics market. To understand the competitive landscape in the adaptive optics market, an analysis of Porter’s Five Forces model for the adaptive optics market has also been included. The report also covers patent analysis with bifurcation into a patent trend, patent by company and patent by region. The study encompasses a market attractiveness analysis, wherein components, type and end-user industry and regional segments are benchmarked based on their market size, growth rate, and general attractiveness. The study provides a crucial view on the adaptive optics by segmenting the market based on components, type and end-user industry and region. All the segments of adaptive optics market have been analyzed based on present and the future trends and the market is estimated from 2017 to 2023. Based on the type, the global adaptive optics market is classified into Next generation adaptive optics (NGAO), ground layer adaptive optics (GLAO), multi-conjugate adaptive optics (MCAO) and multi object adaptive optics (MOAO). Wavefront sensor, wavefront modulator, and control system are the component segment of global adaptive optics market. 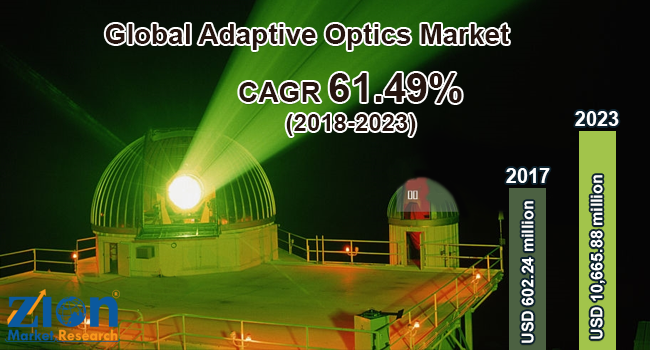 Communication, industrial & manufacturing, military & defense, consumer, biomedical and others are the end user industry segment for adaptive optics market. The regional segmentation comprises the current and forecast demand for the Middle East & Africa, North America, Asia Pacific, Latin America and Europe for adaptive optics market with further categorized into the U.S, Canada, Mexico, UK, France, Germany, Poland, Russia, China, Japan, India, Brazil, and Argentina among others is included in the report. The competitive profiling of noticeable players of adaptive optics market includes company and financial overview, business strategies adopted by them, their recent developments and product offered by them which can help in assessing competition in the market. Noticeable players included in the report are Aplegen, IRIS AO, EOS Technologies, EOS Technologies, Holoeye Photonics, Northrop Grumman Corporation, Adaptive Eyecare, Benchmark Electronics, Boston Micromachines, Phasics Corporation, Synopsys Optical Solutions Group, Adaptica SRL, Baker Adaptive Optics, Schott North America and Sacher Lasertechnik amongst others.